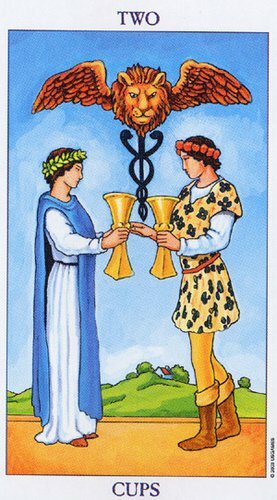 Upon initial examination of the Two of Cups it seems to be a love story, a story of partnership and equality that appears to be protected and embraced by a blessing from above. This inspires me to link the card to one of the greatest love stories ever told. The Taj Mahal meaning ‘crown of palaces’ is a white marble mausoleum located in Agra, India. It was built by Mughal emperor Shah Jahan in memory of his third wife, Mumtaz Mahal. A longstanding myth holds that Shah Jahan planned a mausoleum to be built in black marble across the Yamuna river. It was suggested that he was overthrown by his son before he could build it. Ruins of blackened marble across the river in Moonlight Garden seemed to support this legend. However, excavations carried out in the 1990s found that they were discolored white stones that had turned black. A more credible theory for the origins of the black mausoleum was demonstrated in 2006 by archaeologists who reconstructed part of the pool in the Moonlight Garden. A dark reflection of the white mausoleum could clearly be seen, befitting Shah Jahan's obsession with symmetry and the positioning of the pool itself. This black pool and the reflection of the white Taj Mahal in it would have perfectly demonstrated the duality in this love story. The living and the dead, the light and the dark, the masculine and the feminine, the yin and the yang. The physical and the spiritual. One could almost be forgiven for relating this reflection of partnership back onto the card in which two large wings hover above the couple, as if blessing their union in this world and beyond. This echoes a verse in the Bible that says: What God has joined together, let no man put asunder. Soon after the Taj Mahal's completion, Shah Jahan was disposed of by his son and put under house arrest at nearby Agra Fort. He spent the last 14 years of his life imprisoned there, but with a view of the Taj Mahal from his window. Upon his death he was buried in the mausoleum next to his wife. They were together again, even in death. The Two of Cups. A card that tells us the story of perfect balance, equal partnership, and speaks of honour in relationships that can transcend even the physical.